Today I have achieved something. Something very important to me, and it felt AMAZING! 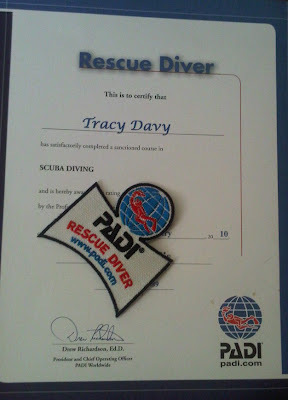 Today I took my 'Rescue Diver' practical exam...which was a full blown 'rescue scenario'. It was cold up at Stoney, very cold indeed. When I set off at 5.30am there were 3 inches of snow on the ground and the roads were like a skating rink. It took me 2 hours to drive the 47 mile journey. I should have known then that today wasn't go to go well! After a 30 minute briefing I had to don my gear (including my brand-new 'worn once only' dry suit) and go down to the water's edge where we were 'pretending' to have a natter about nothing in particular...(that part of the scenario was dead easy for me! ).....just then a diver came running up and said that he'd lost his buddy (careless) and from that moment on it was my baby, and I was completely in charge. (no pressure). I had to ask him where he'd last seen him, how deep they were, how long they'd been in the water, how much compressed air was left in his tank, and what condition his buddy had been in the last time he'd seen him. I then had to instruct a bystander to clear the road, alert the emergency services, fetch a first aid kit, defibrillator, emergency O2 supplies, and blankets, and to alert the emergency boat crew. Then I was in charge of formulating a rescue search. I decided to search a 40m square - searched in a 'mow the lawn' pattern at two depths - 10m and 20m. For this I needed two buddy pairs, so there was me and A.N.Other, and another couple of divers who were standing around. We had to quickly get our gear on and enter the water. After about 5 minutes I located the casualty. He was laying face down on the bottom at a depth of 15 metres, looking pretty lifeless(!). I had to dive down to him and check his responsiveness. He didn't respond (you don't say). Then I had to bring him to the surface - using a special hold, keeping his airway straight, and slowly inflating his BCD as we rose. By now my adrenalin level was sky high and I was running on rocket fuel. Not good! Not good at all. Once at the surface I had to remove his mask and regulator and administer 'mouth to mouth' whilst swimming and towing him back to shore. When we got to the jetty I had to remove his BCD. My gloves were problematic so I removed them with my teeth. That was a huge error as the water temperature was about 2 degrees, so straight away my fingers were really really cold (what?....really really?...Yes Really Really). It took ages to remove his BCD, only using one hand as the other was holding his chin, and I was still giving rescue breaths every five seconds. Once his BCD was off and clear I had to remove mine (using one verrrry cold hand only). By now a crowd of divers had gathered and I had an audience. Apparently the rescue diver course is one of the hardest Padi courses and very few people take it - so it always draws a crowd (I love a crowd....not). Next I had to get him out of the water. Him - 14 stone...Me - 7.5 stone...it was a struggle,(massive understatement) but I managed it somehow.....once on dry land I laid him out and administered CPR and rescue breathing. My insructor then told me I had to shock his heart...so I did....'CLEAR'.....and in the fictitious world we were living in his heart started to beat again. At that point my instructor told me I had passed and about thirty people all started clapping and cheering. It was fab! Nice people these divers. After a de-robe, debrief, cup of coffee and bacon sandwich I went up to the dive shop to buy some new thinner gloves. About 150 people had gathered in the dive shop. My instructor presented me with my badge and certifcate. He said he'd never had a braver, more feisty, more determined or smaller student! He said he'd never seen a 7.5 stone woman rescue a 14 stone diver before, and he hadn't thought that I would manage it. Apparently the instructors (some of whom has taught me before) had been running a small book as to my success or otherwise! Cheek! Every one in the shop was clapping and cheering and then (like the total numpty I am) I promptly burst into tears. I was very proud and extremely pleased. c) the one person I would have liked to have been there with me to share the moment was a figurative thousand miles away. Well done, your a million times braver than me!!!!!! Well done you! very proud of you!